No healthcare professional is ready for patient care without a stethoscope that is reliable, functional, and comfortable enough for frequent use. The Doctor’s Dual Head Stethoscope is the perfect instrument for the professional who cares about both quality and style. 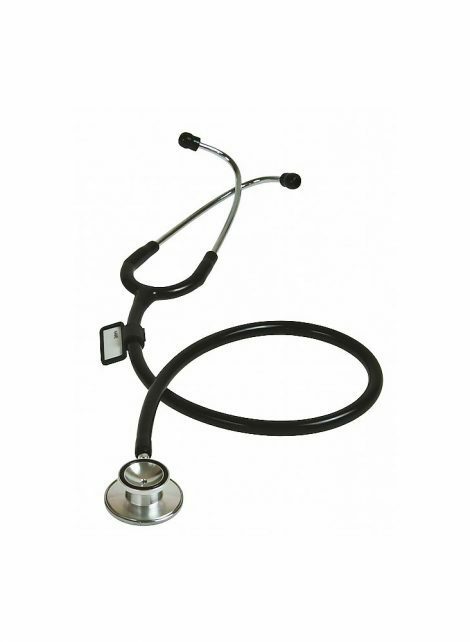 Featuring distinct styling and unsurpassed sound quality, this Doctor’s Dual Head Stethoscope is crafted of lightweight aluminium, flexible PVC, and soft rubber ear tips and non-chill ring. The non-chill ring provides for the patient’s comfort, while the adjustable chrome-plated internal binaural ensures superior sound quality. Reversible head chest piece has remarkable acoustic response. From the first time you use this extraordinary instrument, you will be impressed with its quality engineering and distinctive design. Flexible PVC tubing is 56cm long. Name tag is included. This product is packaged in a hanging display case.